This project was foundet in 2017 of the three NGOs Mathare Foundation, Mathare Youth Film Festival and Partner über Grenzen. Two of them are located in Nairobi, one in Bremen. They formed a network of organizations with the aim of sharing stories through visual arts in Kenya and in Germany through exchange programs. The first exhibition of this photo project took place in the German School of Nairobi on 6th of May 2017. The Kenyan photographers and the most of the German photographers were present on this day, because the Germans made an exchange program, supported by MYFF and PüG. The second exhibition will be in Bremen from 9th to 30th June 2017 in the building of the Bremer Parlament (EuropaPunktBremen). A fourth organization has participated. Mutoto village, a project for disadvantaged children in Lubumbashi (DR Congo). Members of this project will be present at the exhibition opening. The organization have come together to implement a water project through visual arts- mainly through the use of photography. The title of this project is "Maji ni Uhai" meaning Water is life. We will invite youngsters to upload photos and matching texts on this topic to a website of this project. After capturing the photographs we intend to do photography exhibitions in the home countries of the photographers. We also create a discussion stage for human rights on water and sanitation. Our intention is to create an online and offline platform for young people to share the realities of issues related to water amongst other issues. 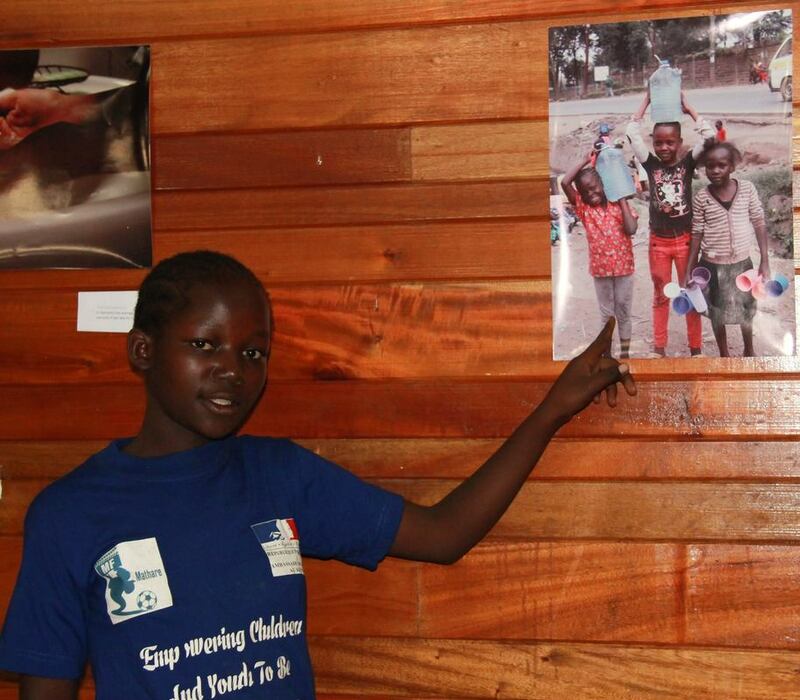 Essentially we will select photos of young people from the partnering organization, who will show their photographs in an exhibition in Nairobi, in Bremen and perhaps in Lubumbashi whose theme is water. At the time of this writing climate change is affecting the whole world and without stepping in and getting solutions, the world is in danger. Keep in mind 70% of the earth is covered with water. It is this fact in mind that has prompted us to implement a project that focuses on water. When there is drought that means rainfall has not been sufficient. In this project we aim to look at some of the best practices to ensure that we do not become victims of climate change for a long time. For instance when we have a lot of rainfall in our respective countries, what should be best standard practice? It is very shameful for us people who live in Kenya since we experience floods when actually we can harvest rainwater and use it in the future. After experiencing floods because we do not care much we encounter a period of drought because we never harvested water. Cutting down of trees and pollution of the air due to plethora of industries that produce chemicals gas that affect the ozone layer which in turns play a key role in bringing drought. Whereas in Germany a lot of environmental and consumer associations claim more transparency so that the people can decide which structures they support whilst consuming, and making them aware of the consequences. Scary too is the high water footprint in Germany: 5.288l per day. Only a small part (120 l) is direct water consumption. The average German consumes 5.168l of water by buying products which are mostly imported. We also have to look at how clean is the water that we drink and what processes are involved in ensuring people from all walks of life get clean water at affordable prices. In the world we have 7.4 billion people out of this population 25% are young people come hence we have a role to play in policy formulation. According to United Nations 780 million people do not have access to clean water and 2.5 billion people do not have adequate sanitation. 6 to 8 million people die annually to consequences of disaster and water related diseases. As young people we have role to play by documenting this issues through photography and formulate policies that will help us curb the situation. In 2015, the United Nations formulated the Sustainable Development Goals. SDG 6 is called "Ensure availability and sustainable management of water and sanitation for all"
Mathare Youth Film Festival (M.Y.F.F) is a film organization from Kenya and around the world. It is registered as a Community Based Organization under the Ministry of gender, children and social development in Mathare slums. It helps young upcoming filmmakers to showcase their creativity through media and arts. MYFF has been part of a global revolution through film by making and screening films about the issues that affects our society today. We are dedicated in transforming the livelihoods of the inhabitants of Mathare and its environs since 2011. Using films as a tool to reach out change, to educate and achieve sustainable development goals, with an aim of creating young professional filmmakers and role models. ​Mathare Foundation is a community-based organization registered under the Ministry of gender, children and social development in Kenya. The organization’s main purpose is to train and create opportunities for disadvantaged children and youth from Mathare slums in photography, football, and performing arts so as to enhance their leadership skills. Award Winning Youth Worker Eric Omwanda Nehemiah and James Ndung’u founded the Mathare Foundation has 60 committed and passionate trainees. The association Partner über Grenzen e.V. (PüG) – is based in Bremen, Germany and creates partnerships between youth from Germany and African countries. The association is committed to international understanding and development cooperation. Partner über Grenzen supports school exchanges and international exchange programs. It arose from a school project of the Gesamtschule Bremen Mitte (GSM).